Q: I have multiple pets. Can they stay together? Do you offer discounts? We welcome multiple pet customers. Of course they are able to stay together and we do offer a discount when they share a suite. Be sure to make reservations early to get a family suite. Also, please indicate if they must be separated for feeding (so one doesn't come home plumper than the other!). As always, while they're in our care, we will make necessary decisions to keep them happy and healthy. If they don't seem to like sharing space with their siblings, we will separate them (and the discount will no longer be applicable). Q: Can I bring toys/blankets/beds from home? Your pets may have one or two toys to play with in their suite during their stay. If you bring toys from home, be sure to mark them with permanent ink with your last name. Your pets' toys will stay with them in their suites and we do our best to return all toys. Occasionally, a toy may be lost during cleaning or if they decide to share their toy with their outside neighbor, that neighbor may not be as gentle with the toy. No tennis balls or tennis ball size toys will be given to dogs that board with us. All toys are inspected for safety prior to being given to pets and throughout their stay, any toy that appears to be a hazard will not be given or returned to your pet. We request that you not bring in any of your pet's bedding for their lodging visit. We provide comfortable and sanitary bedding for all our pet guests laundered daily. Q: My dog is on a special diet. Can I bring my own food? Q: Can I call to check up on my pet? Of course! Our focus during the day is on our guests fun and comfort, so please call between 10am - 4pm. Q: Why is my pet so thirsty after he/she comes home from a lodging stay? It's natural and you should expect your pet to be a bit thirsty from all the excitement once you get them home. However, do not allow them to drink a full bowl of water as it may cause an upset stomach. While in our care, pets are monitored carefully for their consumption of fresh water, and food. Water is continuously checked and refreshed throughout the day. Once your pet settles back into their regular routine, and get comfortable, they will establish regular eating and drinking habits. We realize that plans do change, and wish to accommodate all of our customer's needs. So, there is no charge if you give us more than 48 hours notice. If it's necessary to give less time than that we do charge a two night stay to the credit card on file. Q: Can a family member/Friend come to visit my dog while I am on vacation? While it may seem like a good idea for someone to visit your dog while you are on vacation we ask that you refrain from having anyone plan a visit. 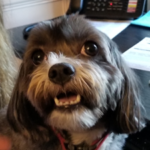 If someone comes to visit and then leaves without taking the dog with them, we have found, that this negatively impacts the mental health of your pup. They just don't understand why they can't leave with this person that they know. This can cause anxiety and depression which can lead to stomach upset and food refusal. Please call us and check on your pet or have your friend/family member call us to see how your pet is doing. Q: How long will my pet's grooming take. 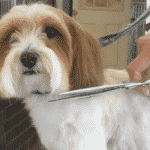 Q: Can I stay and wait for my pet to be groomed? Typically that is not something we recommend. Most dogs, like children, are less fidgety when mommy or daddy isn't around. We want your pet to have a great experience with us and look forward to coming for grooming. In addition, we always call as soon as your dog is finished and we can recommend lots of shopping and restaurants in the area. Q: Can you groom my large breed dog? Of course! We have state of the art equipment, hydraulic grooming tables and ramps to tubs that make every dog's grooming experience a positive one. Q: My dog is matted, but I want to keep his/her coat long. Can you do that? That is something that would have to be determined at check in. The groomer will be happy to discuss your preferences and then examine the dog to see if that is something she can do while keeping your pet comfortable. Sometimes it is necessary to shave part or all of the dog for their comfort, health & safety. Then you can set up regular grooming appointments to achieve the longer, healthy coat you're hoping for. Q: Do you use tranquilizers for anxious or aggressive dogs? We do not administer tranquilizers. We give loving, tender care to every client that passes through our door, even if they may not be in the grooming mood! We appreciate your honesty in letting us know before your first visit if your pet has been known to get grumpy for grooming.If your pet does need tranquilizers, this must be done through your veterinarian and we will strategically time his/her appointment to complete the service. Q: Is it customary to tip a groomer? If you are pleased with your pets' grooming, a tip is certainly appreciated by our grooming staff! Q: How old does my puppy have to be before bringing it to grooming? It's never too early! Even if they just come in and get a brushing, getting them accustomed to the environment, building trust with the grooming staff are all great ways to start out a positive experience for your puppy. Q: How does the MicroBubble treatment compare to regular bathing? Microbubbles work on a much deeper level than any soaps or shampoos. They offer a whole new concept of clean skin. What this means is that microbubble therapy will enhance the efficacy of any other form of “treatment”. Any useful medications whether administered in the form of a shampoo or orally will function much better due to improved pore and hair follicle condition. This is why the unit is being used so extensively in veterinary hospitals in Japan. Microbubble cleansing is unique. It is easy to recognize that clean pores and hair follicles improve skin health. Each skin type and condition will benefit from varying cleansing protocols. Q: How often should my dog get a MicroBubble treatment? Of course, this depends on specific skin condition but in terms of safety and skin condition, daily use would not be harmful. That stated, bi-monthly treatments would really benefit animals with skin and odor concerns, while monthly “routine” use will keep most dogs looking and feeling great. Q: How do you decide what play group my dog will be in? Our staff will perform a temperament evaluation on your dog at the very beginning of their first visit. They will then be matched with other dogs that we know very well of a similar size and energy level. Q: I know my dog isn't always the best in social situations, but I want help showing her that it can be fun. What do you suggest I do? As with anytime you're entrusting someone to care for your pet, it is important that you give us as much information as possible about your pet. We are always willing to attempt to socialize your dog, however, we will NEVER jeopardize any of our guests health or safety in that attempt. If your pet is giving us signs that they are uncomfortable with socialization then we must listen to those signs and we're happy to give them all of the human interaction and playtime they want instead. Q: What time should my dog arrive for daycare? Our daycare drop off times have been set for 6am for those customers that must drop off their pets before work. We like to have all daycare guests checked in by 9am so they don't miss any playgroups. If you're doing a half day (any 4 hour visit) starting in the afternoon, drop off between 12-1pm is best. 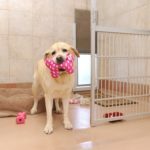 Q: Will my dog get injured at daycare? The safety of our guests is always our top priority. In our initial evaluations, we make every attempt to make sure social daycare visitors do not display any aggressive behavior. We closely monitor dogs and keep play on a fun, friendly basis. Our staff is trained to identify and intervene in any over excitement, fearful, disrespectful or dominant behavior immediately. However, dogs do use their mouths & paws to play; therefore, little scratches are not uncommon. Janry has several areas for our daycare guests. We have two indoor areas as well as an outside covered play pavilion. All of our outside areas have giant shade cabannas for our guests comfort. Q: How does Janry Doggie Daycare benefit my dog? The benefits of our Doggie Daycare program are amazing! Besides having fun, doggie daycare has lots of health benefits. Exercise, socialization, stress relief as well as fresh air and fun are a recipe for a healthy happy dog! Pets stay fit, sleep better, and suffer fewer symptoms of stress. For young dogs, it teaches them invaluable social skills that will help them learn how to properly meet and interact with a variety of other dogs. For the energetic dogs it gives them an outlet for all of the energy other than your couch! It also helps with pets who may get one too many cookies each day to make sure they stay trim and fit. Q: How will Doggie Daycare Benefit my Family? Doggie daycare is a great alternative to leaving your dog home alone or in a crate. Dog owners know that our pooches are most happy when they have a chance to roam, explore, and socialize. And all too often, high energy dogs resort to undesirable behavior such as chewing or going to the bathroom in the house when left to their own devices while you are away. Doggie daycare at Janry is the perfect “drop and go” experience for busy families and working puppy parents. You can drop off your dog bright and early knowing that they are fed, played with, and loved throughout the day. Dogs are naturally social creatures. Doggie daycare gives your dog a chance to romp and play – expelling all that extra energy. It also affords them the opportunity to build friendships with other dogs that are often essential to well-balanced social development. Give us call to schedule you four-legged family member for a complimentary evaluation and full daycare day! Q: How large are your playgroups? Typically we don't have more than 10-12 dogs in a playgroup and there are always 2 staff members closely monitoring the play with that many guests. No. We will provide daycare service for any dog based on their demonstrated behavior. Each guest has a thorough individual evaluation on their first visit. Any dog that demonstrates unprovoked aggression or malicious behavior will be removed from our social daycare setting and we will recommend individual human interactive play time from there forward.